Titan Books, November 2014 oversized (9.3 x 0.8 x 12.2 inches), 176 page hardcover. All artwork in color. Also, Limited Edition (1000 copies) in slipcase with signed numbered print. I ordered the Limited Edition (small image at bottom of post) and it took longer to process through the system. I finally got my copy, and I couldn’t be more pleased. This is a really beautiful book; the binding is high quality, the paper is thick and allows absolutely top quality reproduction of the artwork. And what artwork! Painter Robert McGinnis has earned international renown as a master artist/illustrator, beginning with magazine work, creating illustrations for major magazines such as The Saturday Evening Post and Good Housekeeping. But his reputation was really made as a book cover artist, having painted images for approximately 1,400 titles, for the Mike Shayne, Perry Mason series and many books by Carter Brown, John D. MacDonald and many, many others, including crime, historical, romance, westerns, adventure, classics and more. McGinnis also created poster art for Hollywood, for such movies as Breakfast at Tiffany’s, James Bond films (seven of them), Barbarella (starring Jane Fonda), The Odd Couple, and Cotton Comes to Harlem. Also included, are several stunning McGinnis gallery paintings. Great job, Art Scott for the authoritative, well written text. Many of the works in this book were shot from original paintings, the reproduction is very high quality. This is a must buy for anyone who appreciates fine art and illustration. This entry was posted in art and illustration. Bookmark the permalink. I don’t know why I’ve waited so long to order this book, but finally did. I opted for the non-limited simply because I have pre-ordered other art books of late and the money is adding up. I’ve long been a fan of McGinnis. His is a signature style that is just lovely. I look forward to finally being able to look through this. I agree, Richard. A must-buy. I’ve really enjoyed looking through my copy numerous times. Yeah, it is a terrific book, great pictures, nice size, beautifully done all the way around. And McGinnis is still around to appreciate it! Yes, perhaps I hold have lavished more praise on Art Scott, but I didn’t want to seem gushy. Still he did an outstanding job on this book, no question. 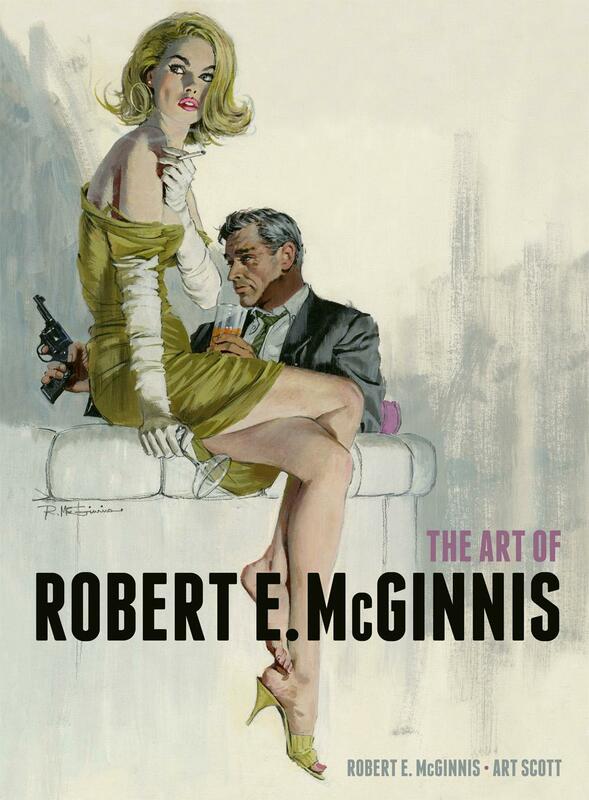 Art Scott had a big role in THE ART OF ROBERT E. MCGINNIS from writing the informative introduction to selection of the artwork. And, as far as I know, Art Scott is the only person on the planet who actually owns all the paperbacks with McGinnis covers! I don’t often buy art books but this one looks pretty cool. Charles, you’ll want this one and also the one I review next week! George, you’re right about Art’s fine work and about his collection. Thanks to Rick and the commenters for the kudos. Bob and I (and Kyle McGinnis, also a key man on the project) are very proud of the book and pleased with the reception. This is a wonderful book. I love my copy, and I keep meaning to do a post on it. I was thrilled when I first read about the book and it was beyond my expectations.